One of the more popular trends that is being seen in the web hosting industry is with web hosts committing to becoming eco-friendly. iPage is one of the many web hosts who have made this claim, saying that they are completely dedicated to being a green hosting company. But are they really a green hosting company? 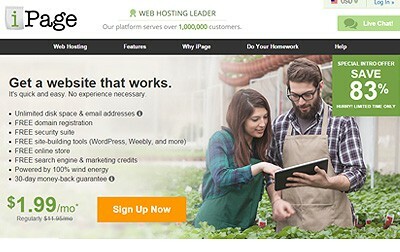 Are they really taking the necessary steps to become an environmentally friendly web host? Well, from many recent reports, they most certainly are. One of the main reasons that iPage is clearly a green hosting company is due to the fact that their servers, offices, and data centers are completely powered by wind energy. In fact, they even allow website owners to display a badge saying ‘Hosted by 100% Wind Energy’ so visitors can see the eco-friendly commitment being made. Not only does iPage power their entire operation through wind energy, but they also consistently purchase Renewable Energy Certificates (RECs). These certificates provide proof that electricity being generated is from a renewable energy resource. According to the iPage site, they have purchased enough RECs to offset energy use by 200%. Overall, iPage has consistently demonstrated that they are fully committed to being a green hosting company. When you decide to sign up for one of their plans, you will have the peace of mind of knowing that you are also supporting the health of the environment.